President Donald Trump's latest criticism on Friday of NFL players who protest during the national anthem and his war of words with LeBron James, last week are only the latest in a string of highly public feuds that Trump has ignited with athletes and sports institutions during his presidency. For many Americans, sports were often viewed as an escape from politics. But in the age of Trump, the sports realm has become deeply entangled in a web of fiery political debates — ones that are often directly sparked by the president. "I've covered sports for a very long time and I've never seen anything like this," sports journalist Christine Brennan, who has been covering this topic since 1981, told ABC News. "This president has entered the sports realm in a way that’s absolutely unprecedented. I am a sports journalist and I would never go into the political until the political realm comes to me ... I never ever, ever have written about a president more than I have with [Donald Trump], and why is that? Because Trump has chosen to crash-land in the world of sports over and over again." One year after San Francisco 49ers quarterback Colin Kaepernick took a knee during the national anthem to protest racism, sparking a wave of activism in sports, Trump brought the conversation back to the national spotlight during a fiery speech at an Alabama rally in September 2017. 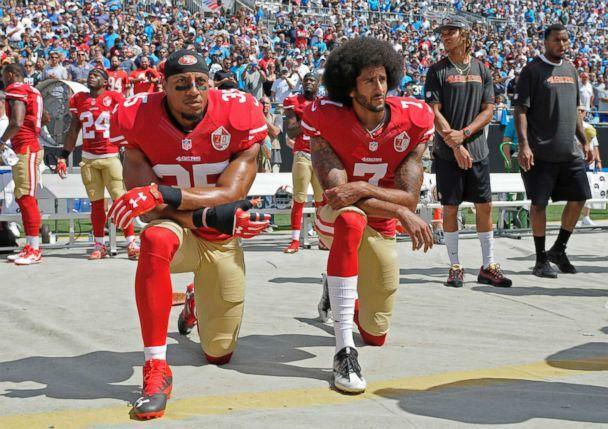 The president ignited a public war with the National Football League and some of the league's biggest stars when he slammed black players like Kaepernick, who took a knee to protest institutionalized racism and police brutality. Trump also lambasted NFL owners for allowing the protests to continue and called on fans to boycott games. "Get that s-- of a b---- off the field right now, he's fired. He's fired!" Trump said, suggesting that this is how team owners should respond to players who protest. He called out some players who took a knee by name, including Oakland Raiders star running back Marshawn Lynch. And in May, Trump suggested that players who protest "shouldn't be in the country." 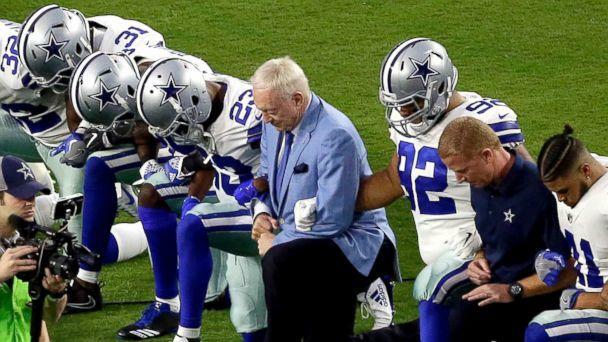 Following Trump's speech in Alabama, owners, coaches and players of various teams joined hands, and some collectively took a knee on the field, in a show of solidarity. For the next few months, the president criticized the protests, questioned NFL Commissioner Roger Goodell's leadership, slammed the NFL's ratings and claimed that "If NFL fans refuse to go to games until players stop disrespecting our Flag & Country, you will see change take place fast. Fire or suspend!" And on Friday he tweeted, that protesting players should be "suspended without pay." "The NFL players are at it again - taking a knee when they should be standing proudly for the National Anthem," Trump tweeted. "Numerous players, from different teams, wanted to show their “outrage” at something that most of them are unable to define. They make a fortune doing what they love.....Be happy, be cool! A football game, that fans are paying soooo much money to watch and enjoy, is no place to protest. Most of that money goes to the players anyway. Find another way to protest. Stand proudly for your National Anthem or be Suspended Without Pay!" And those are only a few of the tweets from Trump about the NFL and the national anthem. The NFL is now grappling with the issue, which has divided the league and prompted a wave of boycotts from both sides, while Trump has continued to weigh in. For many sports champions in the U.S., an invite to the White House — a tradition that dates back to at least the 1960s — had often been an honor. However, sometimes players have elected not to join their teammates, often citing scheduling conflicts. But in the age of Trump, a number of players directly cited their opposition to the president as their reason for skipping the visit. 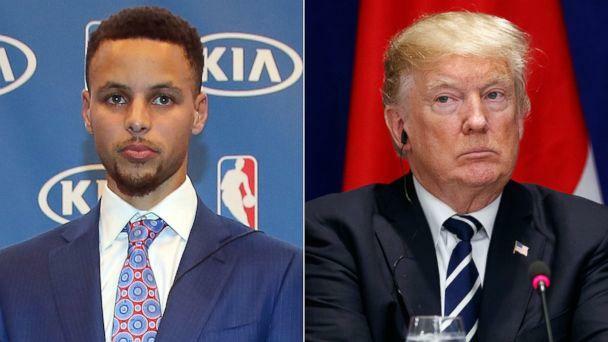 Last year, Trump rescinded an invitation to the 2017 NBA champions, the Golden State Warriors, following a Twitter feud with the Warriors' star player, Steph Curry. Curry, who was outraged by Trump's comments that NFL owners should fire players who take a knee during the national anthem to protest racism, told reporters that he won't be visiting the White House. Despite Curry already saying he wouldn't attend, Trump then took the opportunity to withdraw the Warriors' invitation. Trump's response drew the ire of LeBron James, who reminded the president that Curry had beaten him to the punch when it came to visiting the White House. James, who said last week that Trump is using sports "to divide us," called Trump out on everything from the president's response to the white supremacist rally in Charlottesville, Virginia, to the administration's ban on travelers from majority-Muslim countries. This June, before James' Cleveland Cavaliers faced off against the Warriors in the 2018 NBA finals, Trump said that he didn't plan on inviting either team to the White House. "We're not going to invite either team ... If they don't want to be here, I don't want them," Trump said. The Warriors weren't the only championship team to clash with Trump. On Super Bowl Sunday this year, Trump released a statement urging players to "proudly stand for the anthem." 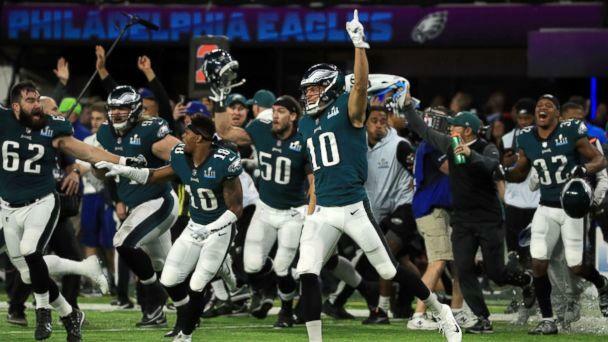 The Philadelphia Eagles won the Super Bowl for the first time in the franchise's history, and while the team was initially invited to the White House, Trump announced in June that the visit had been canceled. Several players, including safety Malcolm Jenkins and wide receiver Torrey Smith, who famously raised their fists to protest racism during the national anthem, had already indicated that they would not attend. The New England Patriots are Trump's all-time favorite team and over the last three years, Trump's friendly relationship with star quarterback Tom Brady has been front and center. Trump, who is also friends with Patriots head coach Bill Belichick and owner Robert Kraft, repeatedly touted his close relationship with the organization, putting Brady and the team in the spotlight a number of times. A day before the 2016 election, Trump announced that Brady and Belichick endorsed his campaign and after he won, announced that they both had called to congratulate him. Brady, who faced backlash in 2015 when a "Make America Great Again" hat was spotted in his locker, has remained evasive when asked about his relationship with Trump. "But, again, that's been someone I've known. I always try to keep it in context because for 16 years you know someone before maybe he was in the position that he was in," he added. He's been very supportive of me for a long time. It's just a friendship. I have a lot of friends. I call a lot of people." 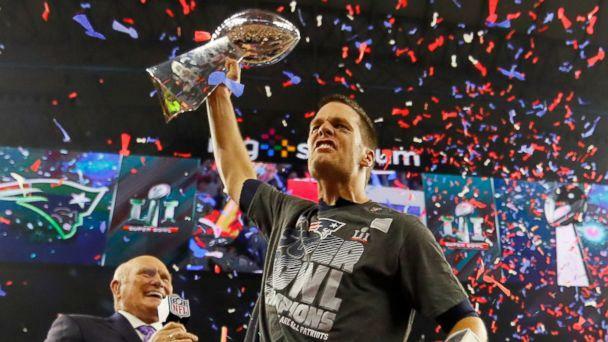 And after much speculation last year, Brady surprised many when he announced that he would not be joining his teammates on their visit to the White House, where the 2017 Super Bowl champs were set to be honored by Trump.